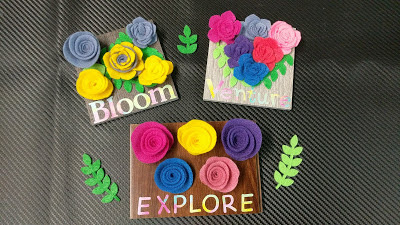 Have you ever seen these flooring samples while wandering the aisles at the hardware store and wondered about making these in to a cool craft? Well! I came up with a fun idea for them. Please note: there is a small charge per piece at Lowe's but so far they have remained free at Home Depot. I used my Cricut Maker to cut the flower shapes and the leaves. Be sure to put in the rotary blade when cutting felt in with the Maker. It works soo much better. I picked various leaf shapes and a couple different shades of green. These were cut on the Maker as well. I used my Cricut Maker to cut this patterned vinyl (from Hobby Lobby) and came up with some random inspiring words. Weed these and they are good to go. Progress is being made! The flowers are easy to put together, you just roll them starting at the skinny end and roll them. There is a round piece at the end that is the flap type of piece you hot glue to the flat base of the flower. Attached the vinyl letters on via transfer tape to get all the letters to align neatly. Decide where you want to place them on your surface and go from there. 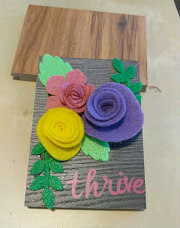 I glued the flowers down first after planning where my letters were going to go. 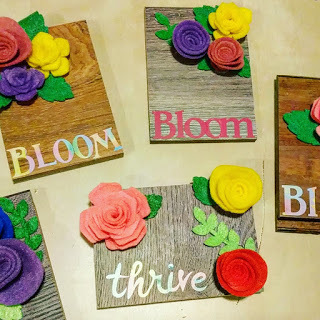 We made these for a Pinterest party, they would be fun to give out as gifts or to a friend or neighbor for a nice way to cheer them up. Hope you enjoyed this simple craft!